This is in Tucson can be driven back to Phoenix or delivered depending on what we agree to. 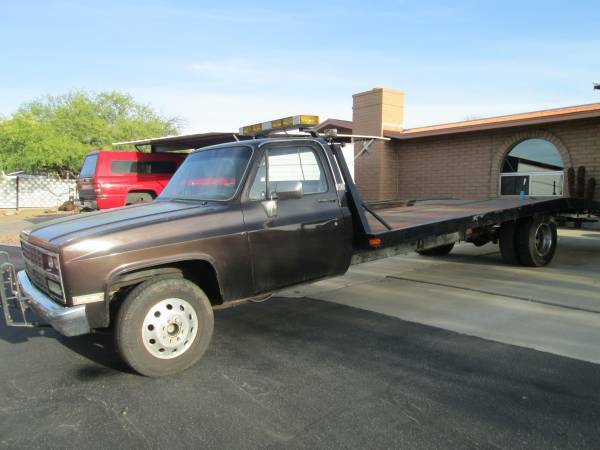 I have for sale a 1974 Chevy flatbed tow truck. It is a homemade bed and it does not have a hydraulic sliding bed. It is a dovetailed flatbed with loading ramps and a Warn 12k pound winch with dual batteries. I have had it for about four months and was going to use it as a "not for hire" personal car hauler. It needs some minor work on the bed and various little "fix its" throughout nothing major and the drivetrain is solid and ready to work. It has a crate 350 chevy that runs great and a 4 speed manual it has powersteering and hydroboost brakes. I am not sure of the mileage. Cab and chassis have zero rust anywhere. Cab has really nice metallic brown paint and no dents. I got it from a salvage parts yard that used it to retrieve local cars for dismantle. I took it through a level II inspection with DMV and it has a clean clear title although they titled it as a 1974 I believe the cab is newer like an 80’s model Silverado. It has excellent tires and wheels taken of the previous owners 2016 Dodge. Interior is clean with a nice dash and door panels and I have a newly upholstered matching bench seat that will go with it. I am not dying to sell it I would still like a personal tow truck but I have other more pressing projects. Price is OBO and I will entertain trades as well.